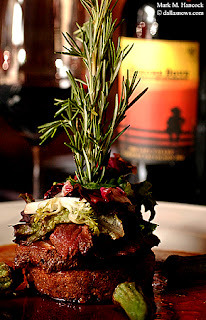 The Lonesome Dove presents a Rosemary Scented Kangaroo Loin with Blue Corn Polenta Cheese Cake, Baby Green Salad and Agave Demi at the western bistro in Fort Worth on Tuesday, April 29, 2003. 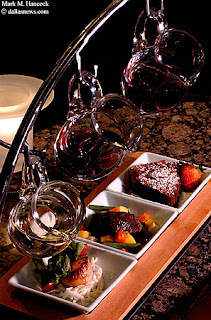 Mercy restaurant offers a Flight Food & Wine Pairing at the restaurant in Addison on Saturday, April 19, 2003. Customers choose three selections each of food and wine. This selection includes: (from left to right) Seared scallop and celery root salad with watercress paired with Famega Vinho Verde 2000, Braised beef (pot a feu) with haricots verts and sweet potato mashers paired with Tapiz 2000 Cabernet Sauvignon, and Press chocolate tarte with almond cream paired with Lang & Reed Cab Franc 1999. I shouldn't have included the candle. It's a distraction. Los Angeles Galaxy's Simon Elliott (No. 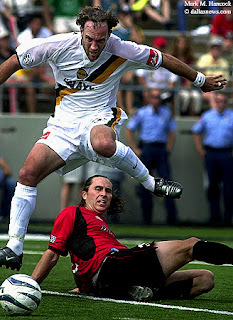 12) jumps over the head of Dallas Burn's Chad Deering (No. 15) to get to the ball during the home opening Major League Soccer game at Dragon Stadium in Southlake on Saturday, April 12, 2003. The game ended as a 1-1 tie after two overtime periods. 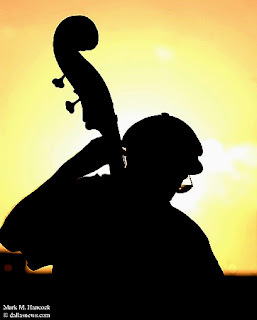 John Adams of the John Adams Trio jazz band plays a bass in the Grapevine city Gazebo off Main Street in downtown Grapevine on Thursday, April 3, 2003. The Convention and Visitors Bureau sponsors free concerts each Thursday to spur area shopping.